Our initiative to launch The Journal of Australian Ceramics (JAC) in venues around Australia was very well received on 17 July when 60-70 people joined Board member Holly Macdonald and Executive Officer Vicki Grima in the ceramics studio at RMIT University, Melbourne. TACA organised and ran the evening event with many people from different groups and sections of the Melbourne community attending. Janetta Kerr-Grant, who had an article in the July 2018 issue, outlined her recent residency in Finland. Vicki spoke about TACA and The JAC including its history, structure, overview of aims and how they are met, current and upcoming activities and plans for the future. Finally, there was general discussion about career pathways, social media and exhibiting, with a panel including artists Kate Jones and Andrei Davidoff. Dinner at a local pub, organised by Robyn Phelan completed the night. 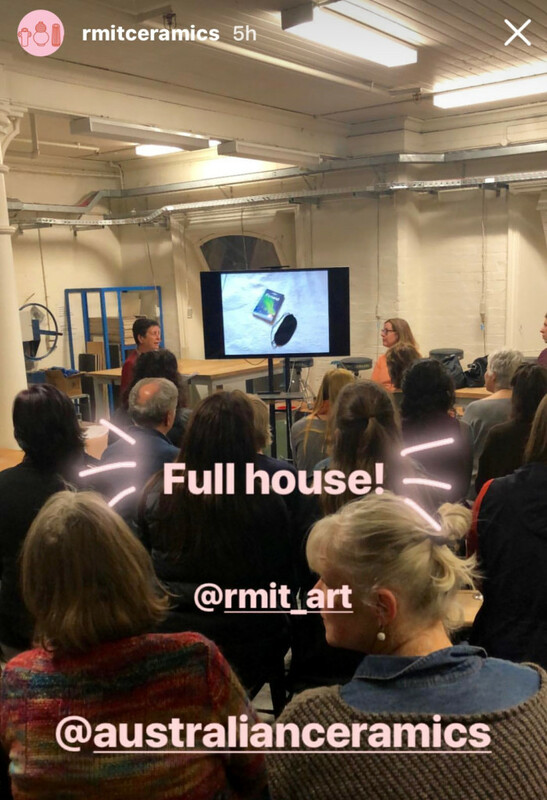 Thank you to Kris Coad, Head of Ceramics for the venue and for facilitating, and to the RMIT students who helped with the preparation. We look forward to the November JAC launch at Perth Studio Potters in Western Australia. TACA is in a strong position due to an increase in JAC advertising, an increase in TACA membership, and careful monitoring of costs. The budget for 2018/19 was accepted including increased staff hours for an increased workload due to a larger membership and a wider range of activities. Membership fees have not increased in over 3 years (since January 2015) and the accountant has advised a small increase. Membership fees will be $135 (up from $120) from 1 January 2019, with student membership to remain at $80. There have been good enrolments for the e-courses and a full review will be taken after the final 2018 course in October. The Board has budgeted for a second round of Online Masterclasses for 2019. The Australian Ceramics Open Studios weekend is the 18 & 19 August and more than 115 studios are registered around Australia. TACA office is investigating dedicated hosting for our Directory website to avoid overloading in the lead-up, and during, this busy weekend. Participants have received advice and support including state or regional maps, posters, TACA membership & subscription forms and a TACA poster. 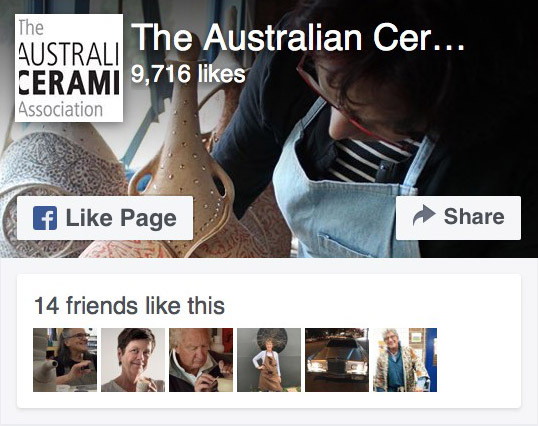 Enjoy visiting or opening a ceramic studio! Two student scholarships will be offered to attend The Australian Ceramics Triennale Tasmania 2019 using the remaining funds from The Trudie Alfred Bequest, along with funds raised by sales of jam donated by Ursula Burgoyne. The Board has been discussing the aims and expectations of TACA Members/Biennial Exhibitions. TACA and Manly Art Gallery & Museum have collaborated since 1989 to hold more than 15 national ceramic exhibitions at MAG&M. TACA has also held exhibitions in other venues – the Australian Ceramics Triennale and Clay Gulgong. We feel that this history, including the structure and curatorship of past exhibitions, could be revisited and shared with members. An Expression of Interest for a curator for the 2020 TACA Exhibition was released. Three positions on The Australian Ceramics Association Board come up for election this year. TACA Board is made up of a maximum of 7 Directors and the Board Secretary and any TACA member can nominate to be on the Board. The Board is elected at the Annual General Meeting from members who nominate no later than 14 days in writing in advance of the AGM. The AGM is on 21 October 2018 at 5pm in TACA’s Sydney office at SQ1 Studios, 32 Bowden Street, Alexandria. Please look out for further notices about Board nominations. To assist Indigenous ceramic artists to access ceramics information through TACA, the Board approved free TACA membership to indigenous communities who have ceramic studios. Permission was requested by, and granted to, Owen Rye to allow Goldmark Gallery in the UK to use a segment of an old Pottery In Australia movie on Shoji Hamada visiting NSW. Cathy is attending the Future/Forward conference held by NAVA in Canberra on 16 & 17 August. Vicki was congratulated on her OAM. The next TACA board meeting is on Sunday 21 October at 3pm at the TACA office, prior to the AGM.